On Thursday, the 17th, we passed the half way mark for our intended destination of Amherst, Mass. Our goal is to complete the Trans-Am route in Yorktown, Va., and then ride to Dave's cousin Bob's house in Amherst. Belinda figures this trip to be about 4600 miles and as of Thursday we had 2300+ miles, putting us just over the half way mark. Yesterday we rode south out of Chanute on Elk Rd. 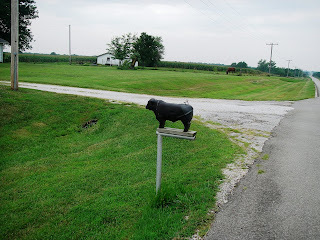 The day was overcast with light winds from the SW. After four or five miles we turned east on 160th Rd. 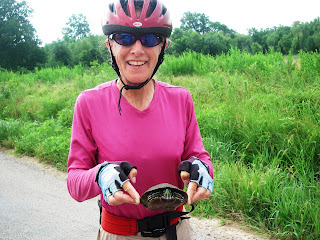 Near the Neosho River crossing we saw this box turtle crossing the road. As we have seen many of these squashed by autos along the roads we decided this guy wouldn't be run over. Belinda put him safely in the grass on the side of the road he was heading towards. We passed through the town of Walnut where we ate lunch and continued east on 680th Ave. By the way, Bill, we passed just three miles north of the town of Brazilton, KS. On Hwy 7 we turned south to Girard, where we stopped at the post office to pick up Daves saddle cover which had been left behind at Ray and Brenda's camp. They kindly mailed it ahead to general delivery in Girard. Thanks again guys! From Girad we zigzaged east and south on various roads the last 15 miles to Pittsburg. The country side has gotten more rolling as we moved east. The crop land has given away to predominately very rich grazing land. We haven't taken many scenic photos due to the unchanging nature of the landscape, but other details catch our eye. 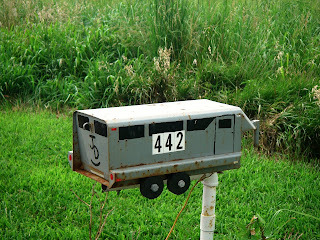 These mailboxs tell something about the nature of the land and the people. Congratulations on passing the halfway mark of your journey! Your blog continues to provide great insight and, along with the pictures, is a real treat. Hey Diana, thanks! It's good to hear from you. It's been a while since you commented last. Glad you're still enjoying the blog. We crossed the border into Missouri today and already the terrain has gotten more hilly. It's like a roller coaster, up and down, up and down, etc. It's kind of fun for a change, but see if our tone doesn't become more whiney as we get into the Ozarks! Hey Leslie, I can't imagine why a big movie star would want to own a town (a very, very small town) in Kansas! Absolutely no star appeal, but maybe that is the appeal..